We want to help you keep your smile whole and intact for a lifetime. But sometimes, a tooth must be removed for your oral and overall wellbeing. The wisdom teeth frequently require extraction. If you do need to have one or more teeth removed, don’t worry —Dr. Gary Rosenfeld performs efficient tooth extraction in Medford. First, we will try to rescue broken or infected teeth to prevent you from losing teeth unless it is absolutely necessary. But when extraction is necessary, we will not hesitate to act in the best interest of your health. There are a number of reasons you may need a tooth extraction. As previously mentioned, the wisdom teeth are the most commonly-extracted teeth. There is rarely sufficient room for these third molars to erupt, which causes them to become impacted, or trapped beneath the gum tissue. Impaction leads to infection, raises the risk of tooth decay, and may lead the surrounding teeth to become crowded. In addition to problematic wisdom teeth, crowded teeth may require removal before orthodontic treatment can begin. A tooth that is too decayed or damaged to be rescued may have to come out to protect oral and overall health. 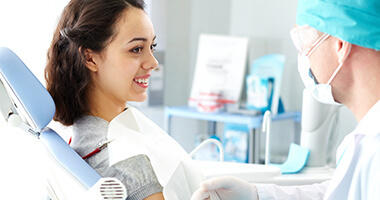 In general, any time a tooth cannot be rescued or presents an issue to a greater number of teeth or your greater oral health, Dr. Rosenfeld is likely to recommend extraction. There are two types of tooth extractions: simple and surgical. Wisdom teeth removals are usually performed through surgical extraction. Healthy teeth can usually be removed through a simple extraction. When the tooth can be removed in a single piece, a simple extraction is performed with forceps. We will apply local anesthesia to ensure you do not feel anything at the removal site. Your dentist will gradually loosen the tooth with a tool called an elevator. Then, once the tooth is moving more freely, Dr. Rosenfeld carefully removes it with forceps. Recovery following a simple extraction is generally fast and associated with little pain. A surgical extraction requires a scalpel and sutures. It is recommended when the tooth is broken or has only partially erupted. To begin, we will make sure you are comfortable with local anesthesia and sedation, as desired. Then Dr. Rosenfeld opens the gum tissue and removes any excess hard and soft tissue that is trapping the tooth. Next, the tooth is removed in multiple pieces. Recoveries from surgical extractions are longer than with simple extractions. Dr. Rosenfeld performs high quality tooth extraction procedures at Island Daily Dental Care. For removal of wisdom teeth in Medford or any other extraction you need, please don’t hesitate to get in touch with us! Schedule an appointment today.